Aw, that is SO cool! - Andrew Hall's 11 year old son talking about the GAC auto-scroll feature. Metop-A is the first in a series of three polar-orbiting satellites carrying a high resolution imager (the AVHRR like those on NOAA-15, 16, 17 and 18) providing "morning" weather satellite coverage of locations all over the world. Uniquely, Metop can download all its data from a single pass when it is in within radio reach of the polar ground station (at Svalbard), and this world-wide continuous data stream is broadcast over EUMETCast to users throughout Europe. 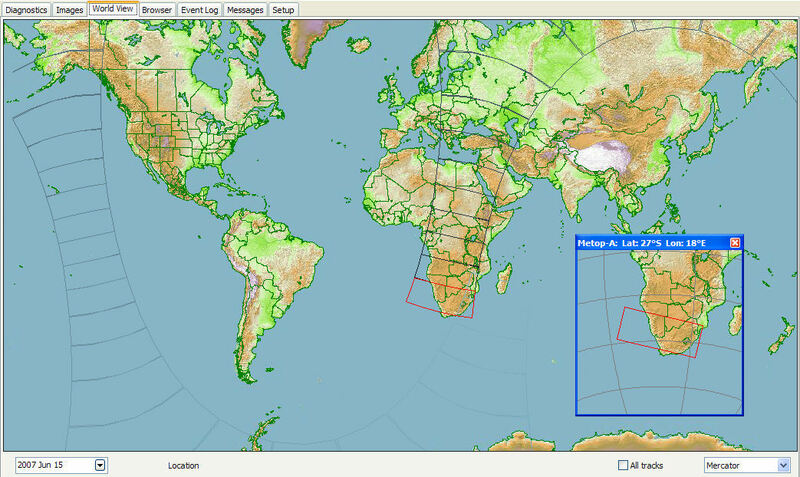 Unlike other high-resolution satellites, you do not need a tracking antenna to get data from Metop, nor are you restricted to data from your local region. These characteristics make for challenges handling Metop data, but for great rewards exploring the world as well! 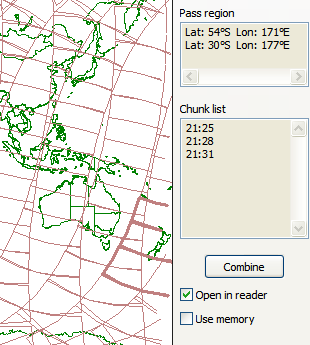 Alan Sewards' quick-start guide to configuring your system for Metop data. Gérard Kruger's French-language guide to using the Metop Manager (PDF format). A sample of today's images from the Metop Manager. manage the chunks to limit the disk space occupied by older data - you can easily use up 13GB per day! this is your rolling Window on the World! combine HRPT files from multiple parts of one orbit to a single "pass"
The program is intended to operate continuously, processing each data chunk as it is received. When not doing continuous processing, the program can also accept individual EPS chunks to analyse and display. There are a number of tabs across the top of the screen allowing different views of the progress. The Setup simply requires you to point the program to the directory where your EPS AVHRR data is being received, the directory where you would like the final data to reside, the number of days of data you want to keep, and the format in which the received data should be saved. One view in the Metop Manager shows a list of the 3-minute chunks in which global Metop data is sent over EUMETCast. The most recent chunk is shown in red, and older chunks are successively greyed out. You can see the most recent chunk here is from off the east coast of Africa, covering the large island of Madagascar and the two smaller islands of Réunion and Mauritius. Alternatively, you can view with a more realistic map-style background as shown below. You can also display a separate, small Location window, providing an orthographic view of the region around the last received chunk. This view can be displayed as a semi-transparent overlay on the Image view as well, and provides a very helpful guide to the question: "Where on earth is that?" when viewing various parts of the world! The images from the five sensor channels can be viewed for each chunk, and the data values under the mouse cursor displayed. The pass direction is also displayed. A simple but very attractive false-colour combination of data from channels 1, 2 and 4 can also be displayed as a visible indication of pass progress. 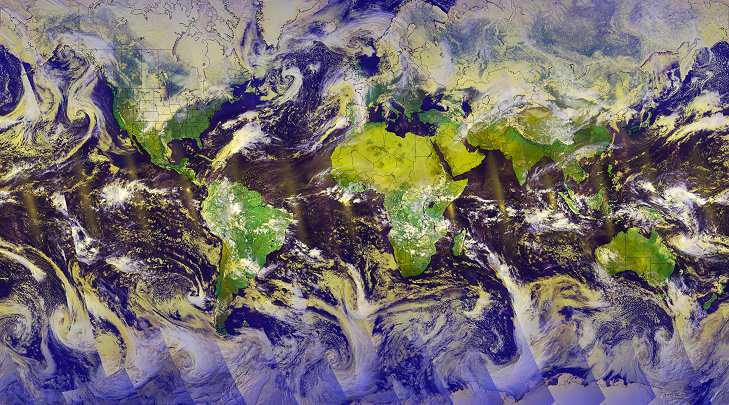 This ever-changing picture also provides a fascinating "Where in the world is that?" intellectual stimulation for you during the day! 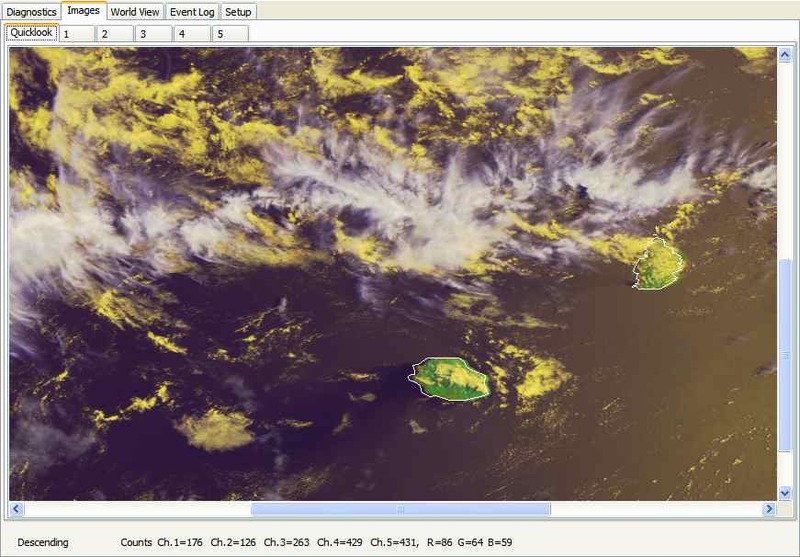 In this screenshot, I have selected the false-colour quick-look tab, displaying the two small island of Réunion and Mauritius from the chunk shown above. Note the green colouring for the land, and the different colours of the clouds showing the different cloud temperatures (i.e. the different cloud height). The resolution is approximately 1km per pixel. 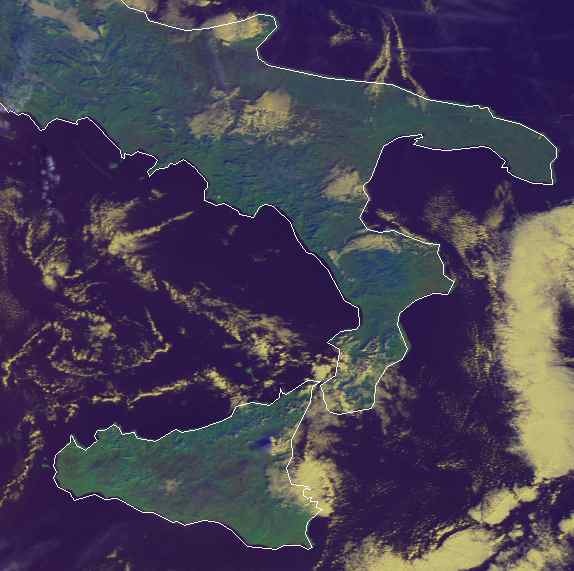 Another chunk, this time from Europe, showing southern Italy and Sicily almost cloud-free in December sunshine. Note the could over Mt. Etna, and perhaps a shadow of the cloud to the north-west. In the Browser, you can see all the chunks received for a particular day, laid out on a world map, and you can combine chunks to view them in, for example, the HRPT Reader. The make the display less cluttered, you can choose to have either the descending (daylight) or ascending (night-time) passes displayed separately. As you move the mouse, the cursor location and the time of the nearest chunk is displayed at the bottom right. To select a set of chunks for combining and display, simply select the region with the mouse in the normal way. To do this, define a rectangle by moving the mouse to the corner of the region, pressing and holding down the left mouse button, drag the mouse to the opposite corner of your selection, and releasing the mouse button. The centre of the rectangle defines the mid-chunk of the combined pass, and the northern and southern limits of the rectangle define the pass extent. Far easier to do than describe! Once the selection is made (as shown below), you can click the Combine button to assemble the composite data. If you have the "Open in reader" box checked, your multi-chunk pass will open automatically in the HRPT Reader (if this is installed on your system). 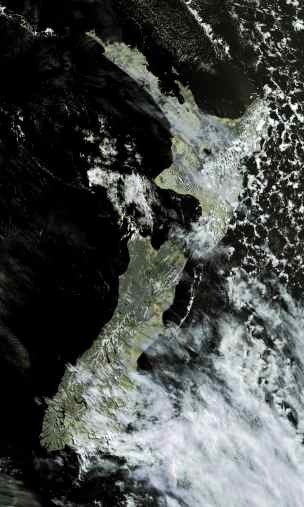 Here we have the passes from 2006 Dec 09, where Metop-A covered New Zealand with a daylight pass around 21:00 UTC. Using the graphical selection, three chunks have been selected ready for combining. One the Combine button was pressed, data from the three selected chunks was assembled into a composite file, and automatically opened in the HRPT Reader, as shown to the right. A continuously updated, world-wide view from the NOAA-19 AVHRR/GAC data now sent as part of the EUMETCast EPS data stream. Another full 8 MB sample is here. 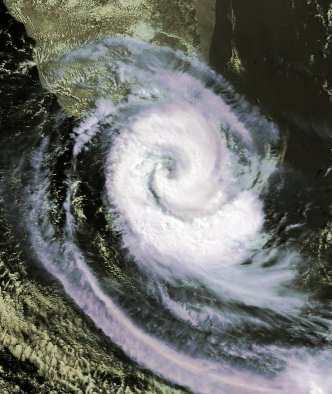 The program works on EPS data as delivered by EUMETSAT. You will need to register with EUMETSAT to get this data. There is guidance on registering here. 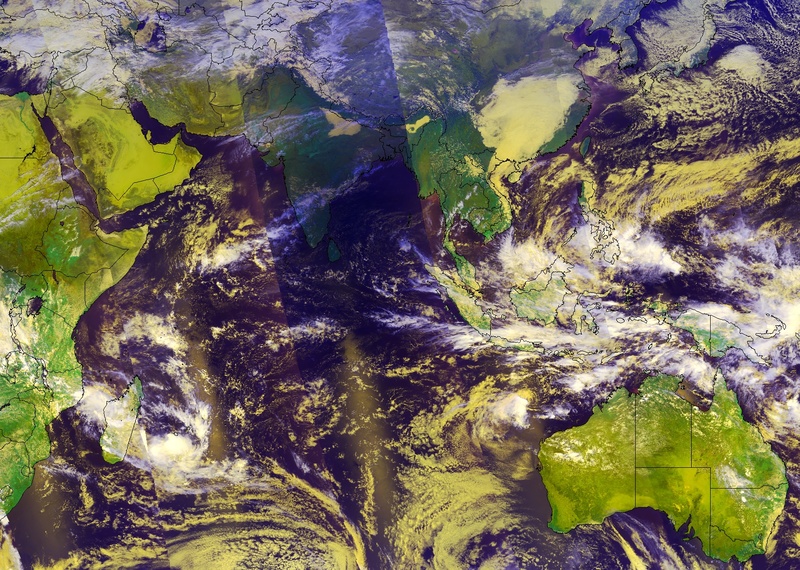 Metop-A AVHRR full-resolution and NOAA-18 GAC resolution image files are currently supported. A screen resolution of at least 1024 x 768 pixels may be required to operate this software. Processor - Pentium III 1GHz or faster. The program requires about 100MB of memory for its own operation, 150MB if GAC data taken. Windows-7 or later is recommended. Other versions may work but are no longer supported. EPS AVHRR data will consume from 7GB to 14GB per day, depending on the format you in which you save the data. Size your hard disk and the number of days you select to save accordingly. V3.0.2 Add last log time to application title, optimise screen-shot saving, only save changes, optimise log-file saving, avoid "not responding" message after start-up. V3.0.4 Add support for Metop-C, accept -LOG parameter - starts with Event Log tab, handle GAC failures more elegantly, accept GSHHG V2.3.7 shoreline & boundary data, try to handle "Another copy..." better across restarts. If you don't already have a Metop Manager 3 key, contact me to purchase a licence update key before using this software. You can register the Metop Manager online. You can register the HRPT Toolset together with Metop Manager online. Problems? Check out the FAQ. Join the Metop self-help group for the latest information on Metop. Read some Hints and Tips for Metop reception. Lire ces informations en français - MS Word, Adobe PDF. Mes remerciements à Gérard Kruger. In September 2012 ESA launched a second Metop satellite for EUMETSAT. Support for this satellite - named Metop-B - is being added to a new upgrade of the Metop Manager as the data comes online and is released to the users. At the time of writing Metop-B GRAS data is supported in release 2.0.2 of the Metop Manager, and support for other data will be added as that data is released. The existing Metop Manager version 1 will not support Metop-B or Metop-C (due for launch in 2016), and existing users can buy a reduced price upgrade for their present Metop Manager to enable it to handle the new data running in a parallel running instance. Without an upgrade licence, the new Metop-B function will not be enabled. Remember to get your PC's hardware fingerprint when buying an upgrade licence. If you bought the Metop Manager after 2012- November-01 it will already include Metop-B capability. How to upgrade: When upgrading, first download and install the new Metop Manager 2. It should continue to work just as the Metop Manager 1 with your existing licence key, but without the new functions. Only then should you order the upgrade, checking the new hardware fingerprint for the order form. Other tasks: You should update to the current HRPT Reader program (V2.10.10 or later), and consider how you will obtain regular Kepler updates. I recommend adding the Metop-B NORAD number to my Kepler Manager software, and adding "38771=Metop-B.txt" to the KeplerManager.ini file. You can download starter historic Kepler data here. Note that the automated restart command file and the background image do not get renamed! There is no need to enter your licence key into the second instance - it shares the licence with the first. To set up the programs for Metop-A and Metop-B: Close both programs, run the new instance, and using Help, Register, enter the new Metop Manager 2 key you have received. You can then restart both copies, and the Help, About should show the string [Metop A & B] after your name as proof of a full-function licence. On the setup tab, you should see a choice of satellite so choose one for Metop-A and the other for Metop-B. You will want to uncheck "Delete other" on both programs for parallel running. Do not blindly copy the source directory locations from the first instance to the second, but you can copy the destination directories as the program will create new sub-directories for the Metop-B data. Leave the source directory locations at their default settings, and build up the new directory locations one at a time until you have the set you need. Leave the unset ones as "-enter-path-" which is supposed to be a directory which will not exist on your system. You can use the same "Processed global Metop files path" and "Processed global NOAA files path" the same as on the first instance, as (a) the Metop-B data will be written to different directory names and (b) only one instance of the program should be enabled as the NOAA data handler (see below). Both programs should have Delete Other unchecked. We need to build up Metop-B support gradually as the new data is released to users, so at the moment only point the second program (Metop-B) at the GRAS data from EPS-6. Leave the other data directories pointing at nothing valid, as they should be by default. The program which will handle NOAA GAC data will be the one where the directory for GAC data points at the received EPS-15 data, so only set that on one program. By default, the second instance should automatically have invalid paths set for all data sources. As Metop-A data will cease at some point in the future, it is recommended that you move reception of NOAA data from your Metop-A to your Metop-B instance by stopping processing on the Metop-A and Metop-B instances, and transferring the directory names and other settings between the two programs. Then point the Metop-A directories at some invalid directory name, or at least one which does not contain EUMETCast data. Information in this section is being expanded as experience with parallel running is gained. Join the Metop self-help group for the latest information. You will need to register with EUMETSAT to have Metop reception enabled. There is a guide to completing the online form, kindly prepared by members of GEO - the Group for Earth Observation. On the online EUMETSAT form, to be sure to check "Global Data Service, METOP AVHRR" in the Polar Data Service section. Be sure that your TelliCast client software is V2.4.4 B (or later if recommended by EUMETSAT). Surprisingly, 2.4.4a is a later version! There is a lot of data! Each 3-minute raw file occupies 28123KB, so that's about 550MB every hour, or 13GB every day. I recommend, as do EUMETSAT, a two-PC configuration with one PC devoted to reception. Should you want to add a Metop PC to your existing system, you can use a standard satellite-TV RF splitter to feed two PCs from one dish and LNB. You can also get dual-output LNBs should you wish. You need to enable PID 510 (decimal) on your SkyStar software. Use Setup4PC as described here. Arne van Belle writes: For enabling PIDs you have to right-click on the green satellite icon and run Setup4PC. Choose Data services and uncheck "Hexadecimal". Now type in '510' in the field left of Insert and click this Insert button. You must set your recv-channels.ini to split the data streams by removing the wildcard [*] entry, and replacing it with a section for each data stream you wish to receive. You may also want to receive the service and test messages which EUMETSAT send out from time to time, as the Metop Manager can process and display these messages. To do this, you need to add an entry for the data channel EPS-18 like this, and point the Metop Manager "TelliCast EPS Service & Test received files path" to the appropriate new directory. You need to add one entry for each data channel you take, so that might include extra channels for DWDSAT data or SAF data. Check carefully that you are getting all the data you expect after removing the [*] entry. There is a list of all the data channels here. Be sure to specify a temporary path to the TelliCast system. This allows the software to build up the file in a different directory to the main receiving one, and then simply "move" the file to the "received" directory once it is complete. On the same disk, "moving" a file is simply a relatively quick rename operation. I have seen files taking 30 seconds to build up, so there is a chance you will get incomplete data should your reception software try and use the data before it is ready. Use the single entry in recv.ini if all your data is saved on the same hard disk, otherwise you need a per-channel entry for the temporary directory in recv-channels.ini. You should also ensure that the logging level is set to quiet (unless you are debugging) to reduce disk activity, and also have TelliCast buffer the log data before writing (use the =>> specifier in the "log_file=" value). You may need to add this entry to recv.ini as it may not be there by default. There may be other lines (shown here as ......) which you should not touch. Please note that any line in these files which starts with the hash character "#", is a comment line, so it is possible to make a line "inactive" by placing a # in front of it, such as in the example above where I have "commented out" one "log_file" line by adding a hash at the start. This allows me to see what the line was before it was changed. If you are running a RAMdisk, ensure it is at least 80MB in size. How do I use a RAMdisk? See Arne van Belle's article here. Also remember to edit the entry in recv.ini to tell the TelliCast software to use the new size of the RAMdisk. 80MB is actually 83886080 bytes, but I like to allow a little margin and specify just 83500000 bytes for the file size. Be sure to check the number of zeros carefully! There may be other lines (shown here as ......) which you should not touch. The example supposes that your RAMdisk is on drive Z: 80MB actually doesn't allow a lot of margin in the case of signal errors are recovery attempts. Already, Arne van Belle has seen his FSY file increase to over 92MB, so for the most robust system a RAMdisk and file_database_size of perhaps 150MB would be safe. Or you can just miss some segments! If you run your system for less than 24 hours per day, you may be able to get away with a smaller size (I would suggest at least 70MB), but if you run 24 x 7 I would suggest a larger size. Of course, if you are limited in memory you may need to compromise (perhaps your older motherboard doesn't allow more than 512MB). If you have plenty of memory, be careful not to set the RAMdisk size too big. Setting it to 300MB may hang the system, and require that you reboot in Safe Mode to reset the value to a lower figure. There may be limits on the size of a RAMdisk using the free AR Soft RAMdisk product (which the MSG-1 group is allowed to provide to its members, you will need to join the group to download this software). I have seen an 80MB RAMdisk allowed in a 512MB Windows 2000 system, and a 300MB RAMdisk in a 2GB Windows XP system [but on later checking, the allocated size shows on a 254MB disk, so do check with CHKDSK Z:). Arne van Belle reports a 1GB system allowing a 132MB RAMdisk. He comments: Symptoms: When you set a higher size ARsoft will start but RAMdisk turns out to be smaller than configured. Only if you set the size very large, there will be no RAMdisk loaded at all. You can see this as an error in the Event Viewer." Members of the MSG-1 self-help group may be able to download the AR Soft RAMdisk from the Files area: MSG-1 group/ => AR-Soft-RAMdisk.zip. (One person has reported that Netscape cannot download the file correctly). There is an alternative free RAMdisk available - details here. EUMETSAT have recently introduced some new products, which may require you to make some changes. "Land SAF South America products were enabled last week as essential data. Users have to enable PID 509 in order to receive the data, otherwise the TelliCast software will turn red on every related transmission. "If you want to turn off reception of this stream and not have the red alarms, please disable the channel in recv-channels.ini and keep the PID selected." 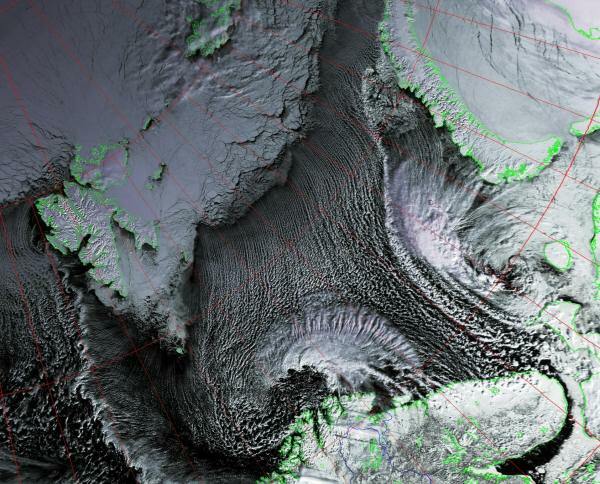 Why does Metop data appear to halt near the North Pole and resume some minutes later? No, it's not waiting for Santa Claus, but it's that the data from one pass can be sent over EUMETCast in slightly less than the orbital period, so there will be a data gap between the end of one pass and the start of the next. The images you see are one orbit delayed. More to come ... please tell me what you have found so that others can share your knowledge and experiences! Are you getting 28.123MB files into your received directory (\EPS-10\ below your TelliCast received directory in the example above). If so, you are getting the EPS-AVHRR data correctly. Note that a new file should appear at least once every three minutes, except for a 15 - 20 minute period at the end of each orbit. have you asked EUMETSAT for the data? have you added PID 510 in your SkyStar configuration? have you set the file_database_size in the TelliCast software? if you are using a RAMdisk, is it at least as big as the file_database_size? I assume you already have reception of MSG-2 and are getting the HRIT/FSD data using a receiver setup with an aerial pointed at the satellite at 9 degrees East (Eurobird 9) on the channel 'Media Broadcast'. Verify that this is correct. If not already set, add the PID 510 (decimal) in the Data Services. Of course, the path you specify may be different on your own system - choose a path under your existing "received" directory. Install the Metop Manager. 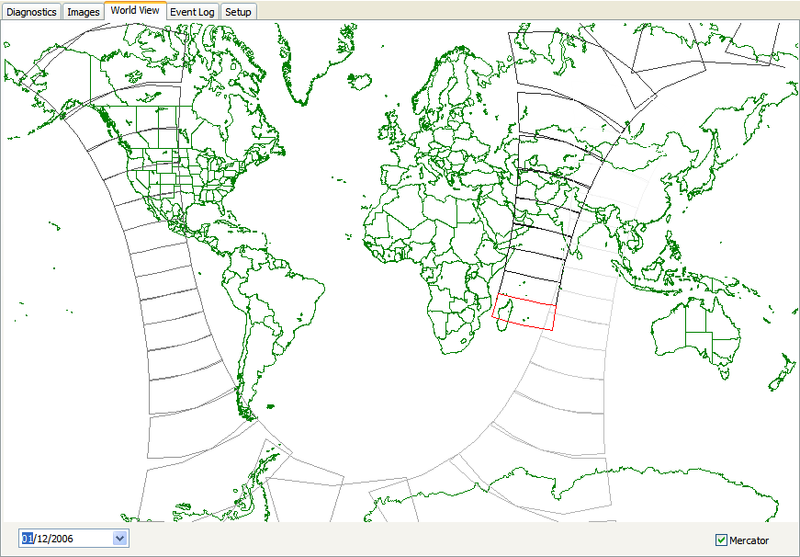 When it is installed, set it up: Under Setup, select the tabs File Controls; Global EPS Metop Data; AVHRR, and fill in the boxes for 'TelliCast Metop AVHRR global received files path' using the 'Browse' button to find and click on the EPS-10 directory you created in step 4; and 'Combined files path' which you will need if you want to use HRPT Reader to look at combined files. Also fill in the box 'Processed EPS Global Files path', which can be anywhere but is usually put in a separate directory called 'EPS-Global' in the Images tree where the MSG image data is stored. As soon as you edit recv-channels.ini and save it, the TelliCast software will start to put data in the received folder specified in 4 above as the target_directory. You can look at this folder with the Windows Explorer and can see the files accumulating. They will not start to disappear until step 5 above is completed and the Metop Manager is running, when it will access the data accumulating in the received folder and process it, deleting it from the received folder as it does so.